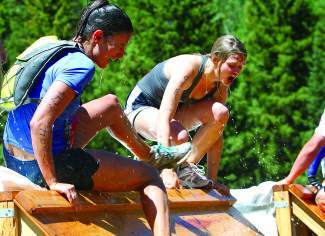 BEAVER CREEK — For the third consecutive year, Beaver Creek Resort will host Tough Mudder on the slopes June 15 and 16. The event draws 25,000 spirited participants and spectators who take to the 11-mile obstacle course designed by British Special Forces and containing 20 features spread across Beaver Creek Mountain. Obstacle highlights include ice cold plunges, 8-foot walls, barbed-wire crawls, 100-foot long mud pits, electroshock therapy and a few other surprises. Each year there’s a new course design in partnership with the U.S. Forest Service and creative new obstacles are added to Tough Mudder’s signature features. This year’s course at Beaver Creek provides excellent spectating at the Ranch, accessed by the Buckaroo Gondola, which will provide free lift rides throughout the weekend. Food and beverage will be available for purchase at the Ranch. The course traverses across the lower part of the mountain and does not travel to Spruce Saddle this year. Event registration gets under way at 7 a.m. on June 15, and participants take off in heats starting at 8 a.m. and run throughout the day. Nearly 10,000 competitors are expected on June 15. On June 16, heats begin at 9 a.m. and last for much of the day. Due to the large number of attendees for the event, Tough Mudder participants and friends and family planning to watch should allow time to park at the Bear, Little Bear or Elk lots or at the Rodeo Lot at Traer Creek in Avon and ride the shuttles to Beaver Creek Village. Shuttles begin operating at 6 a.m. and will run into the early evening. The Bear and Elk lots are expected to fill early, and directional signage will assist with parking information. The Summer Adventure Center will begin daily operations on June 15 and will be open from 9 a.m. to 4:30 p.m. The Centennial Express Lift (No. 6) will open for summer scenic lift rides and lunch at Spruce Saddle, and rides will be free during Tough Mudder weekend only. The lift hours will be from 9:30 a.m. to 4:30 p.m. Regular summer operations and scenic ride pricing will resume on June 17. Tough Mudder spectators should ride the Buckaroo Gondola for access to viewing the event and obstacles; there are no Tough Mudder obstacles located in or around Spruce Saddle. The Hiking Center will be offering hikes on a modified schedule. Beaver Creek Stables will be open for resort guests who must ride the Buckaroo Gondola to the stables. Mountain biking will not be permitted on the mountain during the Tough Mudder weekend.